The Mii Gunner appears from a shrinking energy ball. 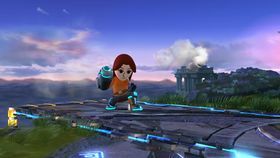 The Mii Gunner is one of the three variations of the Mii Fighters in Super Smash Bros. for Nintendo 3DS / Wii U and Super Smash Bros. Ultimate. It is a Mii Fighter who specializes in longer ranged attacks that center around the arm cannon on its right arm. Like Palutena and the other variations of the Mii Fighters in Super Smash Bros. for Nintendo 3DS / Wii U, the Mii Gunner's custom moves are all separate moves rather than altered versions of the same move and all custom moves are available from the start. The Mii Gunner can also be fitted with unique outfits and hats. Mii Gunners cannot be used when playing With Anyone online, but can be used in battles against friends. 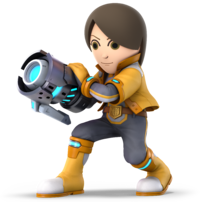 The Mii Gunner's standard special moves are Charge Blast, in which the Mii charges and fires a projectile; Laser Blaze, which allows the player to fire consecutive non-knockback shots; and Grenade Launch, in which the Mii fires a grenade. The Gunner's side special moves include Flame Pillar, which launches a burst of fire onto the stage; Stealth Burst, in which the Mii fires an invisible explosive projectile; and Gunner Missile, which involves the Mii firing missiles. 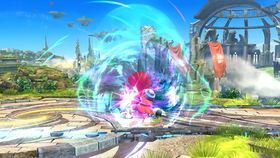 Their down special moves are Echo Reflector, which reflects projectiles; Bomb Drop, which drops an explosive; and Absorbing Vortex, an energy shield that absorbs projectiles and recovers damage. The Mii Gunner's up special moves are Lunar Launch, Cannon Uppercut, and Arm Rocket, all of which involve the Mii using their cannon in various ways to launch themselves into the air. 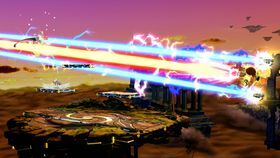 Finally, the Mii Gunner's Final Smash is Full Blast, in which the Mii, accompanied by two drones, fires a large laser across the stage. 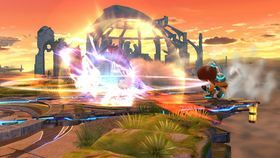 Charge Blast is the Mii Gunner's default standard special move in Super Smash Bros. for Nintendo 3DS and Super Smash Bros. for Wii U, functionally identical to Samus's Charge Shot. The Mii Gunner charges up a blast when the special move button is pressed, and will fire it by pressing the button again or stop charging by tilting the control stick to roll or pressing the grab or shield buttons. If the move is first used in midair, the Mii Gunner automatically fires a projectile without charging. Laser Blaze is the Mii Gunner's second standard special move in Super Smash Bros. for Nintendo 3DS and Super Smash Bros. for Wii U. Similar to Fox's Blaster, the Mii fires shots from the arm cannon repeatedly by rapidly pressing the button. While the shots deal damage, they do not deal knockback but still push opponents back. Not to be confused with Grenade Launcher. Grenade Launch is the Mii Gunner's third neutral special move in Super Smash Bros. for Nintendo 3DS and Super Smash Bros. for Wii U. 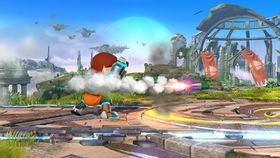 The Mii Gunner fires a grenade at an arc that explodes soon after landing. Holding the special attack button to charge the move causes the grenade to be launched farther. The player can also turn around with the control stick while charging the move. Flame Pillar is the Mii Gunner's default side special move in Super Smash Bros. for Nintendo 3DS and Super Smash Bros. for Wii U. The move is similar to Ness and Lucas's PK Fire and Robin's Arcfire, in that the Mii Gunner fires an energy shot toward the ground ahead that bursts into a pillar of fire when it lands, and instantly knocks opponents away. When used in midair, the Mii Gunner fires the shot at a more downward angle than normal. The fire also slides down walls if the initial shot hits a wall. If the shot does not land, it disappears. Stealth Burst is the Mii Gunner's second side special move in Super Smash Bros. for Nintendo 3DS and Super Smash Bros. for Wii U. 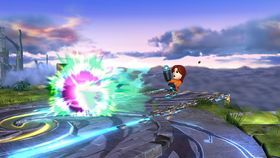 Similar to Zelda's Din's Fire, the Mii Gunner launches an invisible projectile that explodes a short distance away; the distance the projectile travels and the power of the explosion can be increased by holding down the special move button, and explodes when the button is released. The player cannot control the direction the projectile travels, and it automatically explodes upon hitting a surface. If used in midair, the Mii Gunner is rendered helpless when the projectile explodes. Gunner Missile is the Mii Gunner's third side special move in Super Smash Bros. for Nintendo 3DS and Super Smash Bros. for Wii U. The move is functionally identical to Samus's Missile move; the attack normally fires a small homing missile, while using the move similar to a smash attack fires a larger, more powerful missile that flies directly forward. 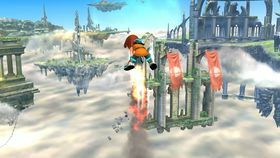 Lunar Launch is the Mii Gunner's default up special move in Super Smash Bros. for Nintendo 3DS and Super Smash Bros. for Wii U. 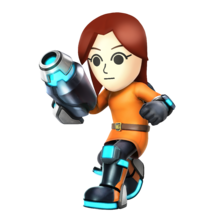 The Mii Gunner fires a blast toward the ground, propelling them into the air and damaging any opponents nearby. When used in the air, the explosion also travels toward the ground and is still able to deal damage. Cannon Uppercut is the Mii Gunner's second up special move in Super Smash Bros. for Nintendo 3DS and Super Smash Bros. for Wii U. When used, the Mii Gunner fires a blast directly down to launch themselves into the air with an uppercut attack, which can deal two hits. The blast attack can also meteor smash. Arm Rocket is the Mii Gunner's third up special move in Super Smash Bros. for Nintendo 3DS and Super Smash Bros. for Wii U. The Mii Gunner uses their cannon to briefly propel themselves into the air. The player can use the control stick to change the angle of the launch. Echo Reflector is the Mii Gunner's default down special move in Super Smash Bros. for Nintendo 3DS and Super Smash Bros. for Wii U. 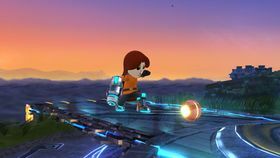 When used, the Mii Gunner uses their cannon to create an energy barrier that reflects all projectile attacks, similar in function to Fox's Reflector. The move also deals slight damage and knockback to nearby foes when used. 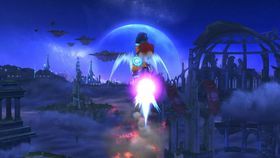 When used in midair, the reflector briefly decreases the Mii Gunner's falling speed. 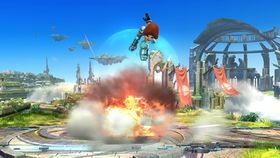 Bomb Drop is the Mii Gunner's second down special move in Super Smash Bros. for Nintendo 3DS and Super Smash Bros. for Wii U. 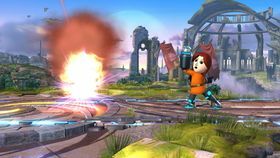 The Mii Gunner drops a small bomb onto the stage, which explodes after a second. The bomb detonates automatically if it touches an opponent. 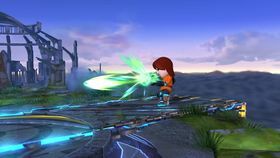 Absorbing Vortex is the Mii Gunner's third down special move in Super Smash Bros. for Nintendo 3DS and Super Smash Bros. for Wii U. 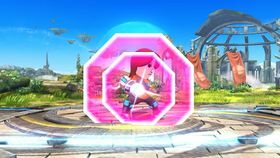 Similar to Ness and Lucas's PSI Magnet, the Mii Gunner surrounds themselves with an energy barrier that absorbs any projectile attacks and heals them for a certain amount of damage depending on the attack. Full Blast is the Mii Gunner's Final Smash in Super Smash Bros. for Nintendo 3DS and Super Smash Bros. for Wii U. When activated, the Mii Gunner summons two turrets around them. All three fire a large laser blast that can be angled using the analog stick, repeatedly damaging opponents caught in the blast. At the end of the move, the lasers discharges, launching the trapped opponents. The laser has a long range and can also go through walls and obstacles. Wii U Super Smash Bros. for Wii U A Mii sporting a blaster arm, this fighter is a great choice for those who prefer to fight the battle from a distance. The Mii Gunner has a lot of special projectile moves available, so pick your favorites and use them when needed. Don't forget about standard and smash attacks! A fighter based on your Mii! Gunners are all about the guns, of course. No matter how you set up your specials, you'll end up with a powerful arsenal. And it's not just their special moves that have excellent range - they have standard and smash attacks that can really go the distance too. Use them to dominate the battle from afar. Wii U Super Smash Bros. for Wii U One of the Mii Gunner's side specials is Stealth Burst. The missile blends in, making it tough to see. Plus, you can control when it explodes, so it's handy for surprise attacks! You could also use Absorbing Vortex to absorb damage done to you by energy weapons. This is one fighter with a lot of tricks up its sleeve! One of the Mii Gunner's side specials is Stealth Burst. This burst blends in, making it tough to see. Plus, you can control when it explodes, so it's handy for surprise attacks! You could also use Absorbing Vortex to absorb damage done to you by energy weapons. This is one fighter with a lot of tricks up its sleeve! N/A The Mii Gunner's Final Smash unleashes a a wide, long-range beam of painful energy. The laser will hit several times, pushing back opponents before launching them with the last blow. You can adjust the laser beam's angle, so punish a foe who thought he or she was safe by trying to duck under the beam! Mii Gunner's Final Smash is a set of laser beams fired straight ahead that reach all the way across the screen. These can hit repeatedly and push foes back, ultimately launching them at the end. While firing the beams, you can tilt them up and down, so fine-tune the angle to really go for your foes! Pit: That gear looks like it belongs to Mega Man. Viridi: Wrong and wrong. That's a Mii Gunner. All of them carry arm cannons and backpacks. Palutena: That backpack looks heavy, but that's because it's filled with different types of ammunition. Viridi: How do Mii Gunners choose which type of ammo to shoot? Palutena: There's a motion-controlled trigger in the arm cannon. Pit: So the stance they take when firing tells me where they're aiming. Viridi: Motion control... That's downright REVOLUTIONARY! We should patent that. Palutena: Hmph. Sounds like the goddess of nature has turned into the goddess of commerce. This page was last edited on December 25, 2018, at 20:35.